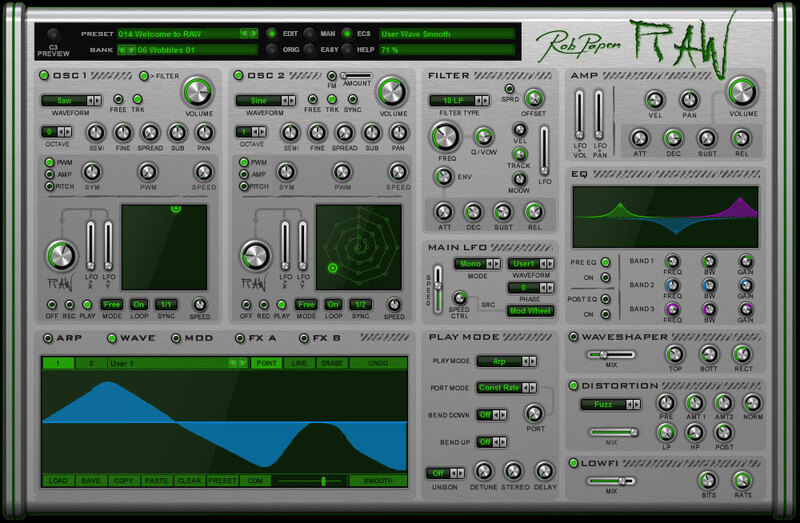 RAW by Rob Papen is a Virtual Instrument Audio Plugin. It functions as a VST Plugin, an Audio Units Plugin and an AAX Plugin. When namesake company founder and sought-after sound designer Rob Papen attended the Dutch Dancefair on his home turf to demonstrate his sought-after (soft) wares, little did he know that he would come away with an almost fully-formed idea for an all-new soft synth. So how, exactly, did that happen? Haphazardly, as it happened. Here producers Sebastian Hoff and Freek Vergoossen (a.k.a. DJ Promo and DJ Free-K, respectively) made an approach to propose a synthesizer that focused more on 'distorted' sounds with an easy-to-use layout. Always open to the idea of delivering fresh, cutting-edge, and — moreover — musical plug-ins for producers, whatever their musical leanings, Rob responded favourably by inviting the two DJs to his well-stocked studio for a brainstorming session. Said session resulted in a list of 'must-have' features and tools, sowing the seeds for RAW. 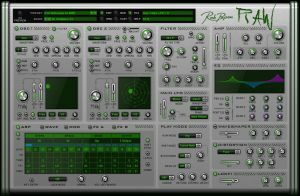 Reason has it that might just as easily not have happened, had Rob Papen not had the foresight and wherewithal to see the curious concept through to its cutting-edge completion. "While I'm always seeking new directions, I noticed that I also have roadblocks to my way of thinking," he states in a moment of refreshingly raw honesty. "Maybe this is because of my long-lasting association with classic analogue hardware synthesizers like the Minimoog and Roland Jupiter-8 that don't have onboard effects or EQ. I can clearly remember the first synthesizers that came complete with EQ, which was weird. 'EQ is for mixing desks, ' I thought. On the other hand, I enjoyed effects like chorus, phaser, delays, and so on when they started showing up on synths. So the moment that DJ Promo and DJ Free-K discussed this idea of synthesizers having more 'distortion' and EQ, my immediate thought was, 'EQ in a synth? Mmm...' Then I said to myself, 'Rob, you must get past this roadblock and look into this with an open mind." Mindful of those ideas, the Rob Papen development team truly thought outside of the box and now — within a matter of months of that fateful first meeting — RAW is here for all to see and hear. 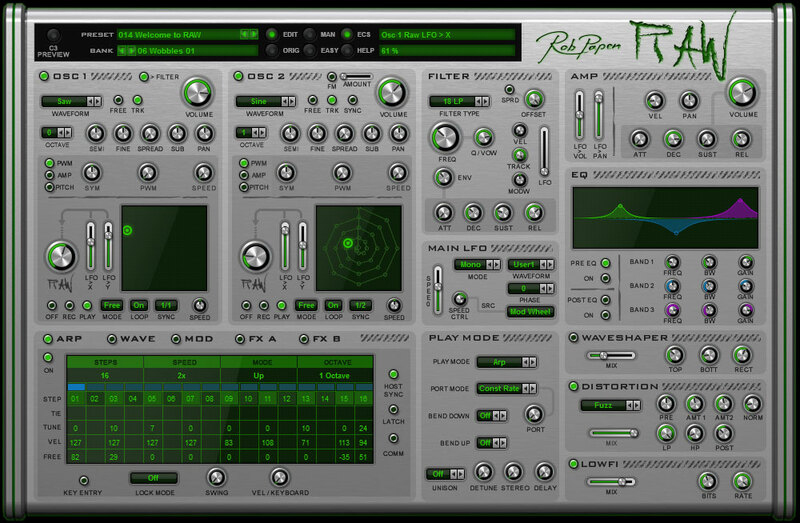 How does it differ from other developers' soft synth offerings — as well as those musical must-haves from Rob Papen, of course — currently out there, then? Its co-creator comes clean about its inherent idiosyncrasies: "RAW has a focus on 'distorted' sounds, so this means that it has a different signal setup, synthesizer-wise. We have two oscillators and a FILTER, but what is new when compared to our other synthesizers is that you have an EQ that can be pre- or post-distortion. After that, there is also a WAVESHAPER and dedicated DISTORTION module with several types of distortion, as well as a LOW FI control. This is new to this synthesizer, and it's part of the concept that the distortions are on the voice level, so it's not just a case of a total signal going into the distortions, but rather each voice has its own WAVESHAPER, DISTORTION, and LOW FI — plenty of options to shape the sound here." However, in typical Rob Papen style, that's not all. Far from it, in fact. In addition to the flexible X/Y fields found in the feature-packed OSC 1 and OSC 2 sections (which will already be familiar to refined Rob Papen Predator and BLUE-II soft synth users), RAW users can effectively draw their own 'waveforms' to be used as LFO waveforms, enabling the creation of unique 'wobble' sound movements — perfect for dubstep and other EDM styles. Other effects such as CHORUS, FLANGER, PHASER, and STEREO DELAY — not forgetting Rob Papen's proprietary high-quality REVERB — all add to the superlative sound sculpting possibilities on offer, as does the super-cool step sequencer/arpeggiator, and many more fanciful features above and beyond. But mindful of that original easy-to-use layout request, a self-explanatory Easypage makes things even easier to understand and use — grab and go, so-to-speak. 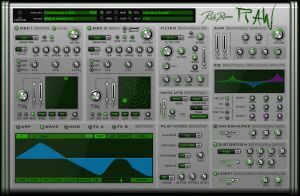 Speaking of which, user presets are arguably always where it's at when it comes to true originality, of course, but by enlisting the tuned-in talents of world-class DJs and producers — such as Deathmachine, DJ Hidden, DJ Promo, DJ Thera, D-Passion, Ophidian, Mad Dog, Rob Fabrie, N-Vitral, The Playah, The Viper, Warface, and many more besides — to create crowd-pleasing presets galore for RAW alongside the numerous creative contributions from Rob Papen himself instant inspiration is truly guaranteed. Just add tunes, turn up the distortion, and mix to taste... you'll soon be sounding really RAW. All in the best possible taste, of course. Exciting time! Rob Papen et al are a very busy gang.